February 12, 2019, 1:26 AM · On Leonard Bernstein’s centenary it comes as no surprise that we are hearing many of his works in the concert halls and in the media. As a violinist I knew that Bernstein wrote a Serenade after Plato’s “Symposium” and an early sonata for violin, but nothing else -- or so I thought. 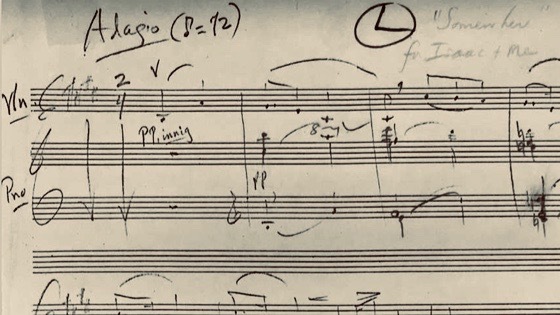 According to Nigel Simeone’s book Leonard Bernstein: West Side Story, this arrangement was written for Isaac Stern and Lenny to play at the rally for Mayor Lindsay in Felt auditorium of Madison Square Garden on October 11, 1969. In 1969 there was a gala benefit for Mayor Lindsay. Tickets were $150 a piece (adjusting for inflation that’s about $1000 in 2019). But I guess it was well worth it if you get a who’s who of the 1960’s: Frank Sinatra, Judy Collins, Ethel Merman, Harry Belafonte, Barbra Streisand, Helen Hayes, Robert Ryan, Sidney Poitier, Dustin Hoffman, Woody Allen, Alan Arkin, Leonard Bernstein, Julie Harris, James Earl Jones, Jerry Orbach, Robert Redford, George Segal and Eli Wallach with host Merv Griffin. (more info and some audio from the Streisand portion of the concert can be found here. But wait? There’s a piece for violin and piano that Bernstein wrote that nobody has heard of? From the manuscript: at top right is the note, "'Somewhere' for Isaac and Me." Image courtesy Library of Congress. I wondered if this was just a copy of the vocal selections or the conductor score. It turned out to be a new and different arrangement. Of course, this quick arrangement was not the easiest thing to read so I asked my friend Krista Adams Santilli to notate it. I figured as a soprano she would have a better chance of figuring it out than I would. In short order she had it back to me. I asked my friend Michael Cooney to go over it with me. You may remember him from such misadventures as my Young Frankenstein project. But “Mac” is much more than just an organist. He’s a pianist, composer and Professor of Music at Fairfield University where Bernstein and family owned a home. "...although Fairfield was a welcome weekend retreat, a place of 'jollity ... untainted by sadness,' the family’s roots were in Manhattan. 'We didn’t really interact very much with the year-round residents in Fairfield,' Jamie wrote. Except for a jaunt to Zera Musicland or trolling 'the antique shops and junk shops along Route 7,' why would they? After all, they numbered among their friends and guests Jackie Kennedy, Isaac Stern, Aaron Copland, Betty Comden, Adolph Green, Stephen Sondheim, Richard Avedon, Mike Nichols, Lauren Bacall and so many others." Bernstein was specific in what he wanted. He meticulously marked the figures, rhythms even the bowings. After playing it a bit we asked some other friends for advice. The dotted rhythms in the left hand of the piano sometimes conflicted with the triplets in the right until percussionist Michael Blancaflor said that Bernstein liked that dotted rhythm swung a bit and that aligned it more naturally with the triplets. I admit to making one small change in the violin part. 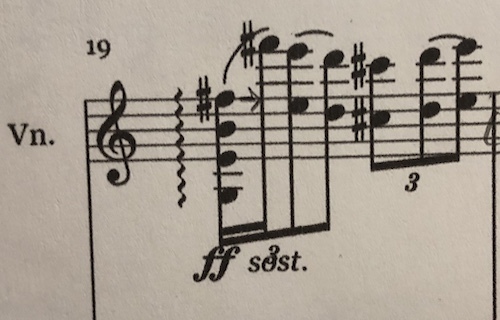 In the following example, I don’t think I can put my first finger and cover the D, A and E string so I figured I would move the F sharp to the next 16th note and make the roll go from one sixteenth into the next. From what I have read, Bernstein wrote the songs and the orchestration, under his guidance, was done by Sid Ramin and Irwin Kostal. Theirs was a massive undertaking as they completed the Broadway score orchestration in three weeks. During its stage runs Bernstein never conducted the show but of course orchestrated parts of it for his Symphonic Dances in 1961. In the fascinating documentary about the making of the Deutsche Grammophon album, Bernstein says he has studied the score well and knows it. He is correct in saying it has everything in it! This version provides us with Bernstein’s own reduction of the score. Stripped down to just the violin and piano, Bernstein give us all we need and though I know the Broadway version, I don’t feel I am missing anything of the emotion or the raw power of the work. This is genius at work (his, not ours). And it is our pleasure to present this premier video. Michael and I hope you enjoy this video as much as we enjoyed working on it. I would like the thank the Leonard Bernstein Office for their help in securing permission for me to work on this project. February 12, 2019 at 01:42 PM · Darwin, What an incredibly exciting discovery! "Somewhere" is one of the greatest songs of all time. You play so beautifully! Best of luck with this project! It's people like you who make the musical world brighter. February 12, 2019 at 05:52 PM · What a fantastic find, and a beautiful project to immerse yourself in. 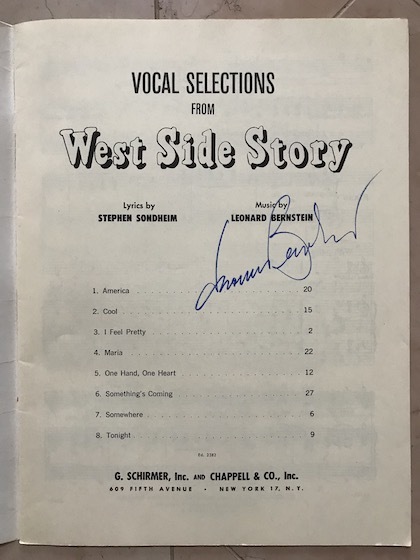 Thank you for the effort in putting it together, as well as the care in sharing the details surrounding Bernstein's actual involvement in the song/score arrangements for West Side Story. I had to bookmark the documentary to watch later, though. And I will be watching it! February 12, 2019 at 06:40 PM · Bravo Darwin! What a lovely arrangement and performance! Excellent job uncovering this previously unknown transcription. I wish one of my teachers (David Nadien) who was Bernstein’s NY Phil Concertmaster could’ve heard this! February 12, 2019 at 06:57 PM · Great investigative work as always with your projects Darwin, and, beautifully performed, all my best wishes. February 13, 2019 at 05:00 AM · How can I get a copy of this arrangement? February 13, 2019 at 08:26 PM · Love it! <3 Is the sheet music available? February 13, 2019 at 08:28 PM · Love it! Can I get the sheet music someway? That’s a beautiful discovery and you played it with haunting feeling. Remarkable. West Side Story still stands as a landmark in American musicals. Thank you for your work on this project. February 14, 2019 at 03:04 PM · Gorgeous! Thanks so much for sharing that great find. West Side Story is to me so much more interesting musically than most of the other musicals before or since. Maybe because it was written by one of America's best composers. February 16, 2019 at 08:55 PM · This music is at this time unpublished. In working with the Leonard Bernstein Office, I gave them a copy and hope that with this article and interest they will publish it so that more people can play it. My project was for educational purposes only.